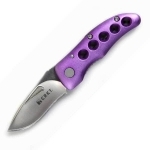 The Squeak is one of my knives that gets the most carry time. This is for several reasons. First, it's easy to carry. It's small, light, and non-threatening. I work in a place where one isn't supposed to carry a knife. No-one has ever batted an eye when I've pulled the squeak out to use. Second, despite being small its ergonomics are terrific. While I can only get a 3 finger grip (well 2.5 fingers rounded up) on the squeak with my giant ham fists, because of the well designed handle and a nicely jimped thumb ramp and choil, the squeak feels super secure in hand. Third, while the blade is less than 2 inches, because of good design and very nice steel, the squeak is a really good cutter. It goes through cardboard and cordage like a bean burrito goes through my colon when I'm on a road trip where the next rest stop is a 100 miles away. Four, it comes in pink. That's all I need to say. In summary - the squeak is a terrific EDC blade if you don't need to carry a massive limb hacker. Great EDC blade! I carry this where big knives may scare some people. The steel choice is great, Nco690. The slipit non locking mechanism has a nice lockup for a "nonlocking" knife. The wire pocket clip is very nice and carries deep in your pocket. Nice jimping top and bottom, nice finger choil.